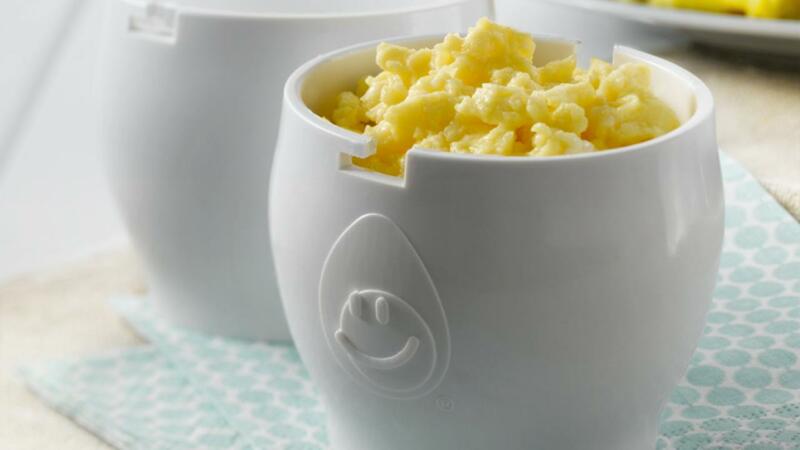 Enjoy scrambled eggs in minutes when cooking your eggs in the microwave. Check out the video below, where we show you how quick and easy it is to make eggs in the microwave. Sprinkle a few grains of salt in bottom of the egg cooker. (Salt attracts microwave energy and will help to cook eggs evenly.) Break egg into egg cooker. Whisk egg with fork. (Or, whisk egg in small bowl, then pour into egg cooker) Place lid on cooker base, lining up notches. Twist to secure. Place into microwave. Microwave on High (100% power) for 35 seconds, stirring halfway through cooking. Let stand for 20 seconds. Stir to scramble egg before removing from egg cooker. Cooking times will vary if more than one egg is cooked at a time. Please refer to our recipes for using 2 Microwave Egg Cookers in 1 microwave, and for 2 eggs in 1 Microwave Egg Cooker. Times given are for a large egg. The egg cooker works best with large eggs. Lowering the power level to Medium High (70% power) or Medium (50% power) and increasing the cooking time slightly is also an option. After each use, wash egg cooker thoroughly with hot soapy water; rinse and dry. The egg cooker is safe to use in both dishwasher and microwave. Do NOT use in convection microwave oven set to convection mode. When cooking eggs in the microwave, always use a microwave-safe container such as the egg cooker, and pierce yolk and white several times or whisk before cooking.